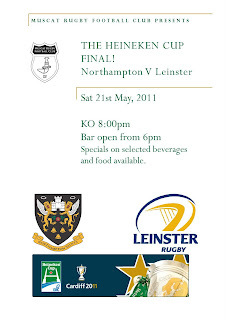 For those of you that follow the Heineken Cup rugby tournament, the final is tonight, at 8pm. This year sees Irish club, Leinster (champions in 2009) show down against English club, Northampton Saints (champions in 2000). The game is not on OSN, but Jazeera Sports. 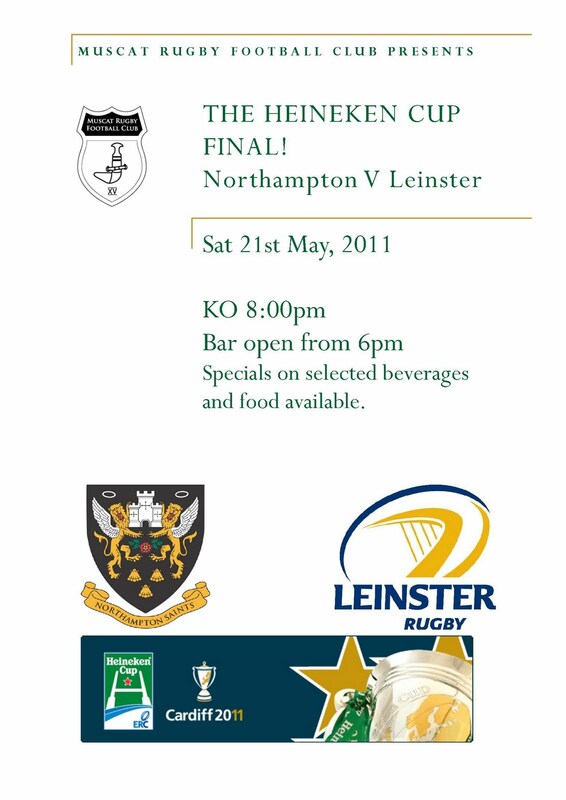 You can watch it live at the Rugby Club. 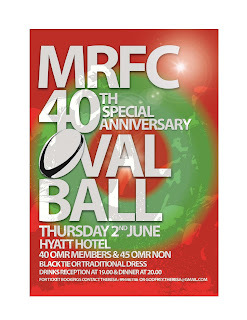 Firstly, there is the annual Oval Ball, this year to be held on Thursday the 2nd of June at the Afrah ballroom in the Hyatt. Tickets are still available but going quickly, this is one of the best balls held every year (right up there with the ANZO ball and the Canadian Stampede) and I could not recommend it enough.The information to purchase tickets is on the poster below - RO 45 for non-members. 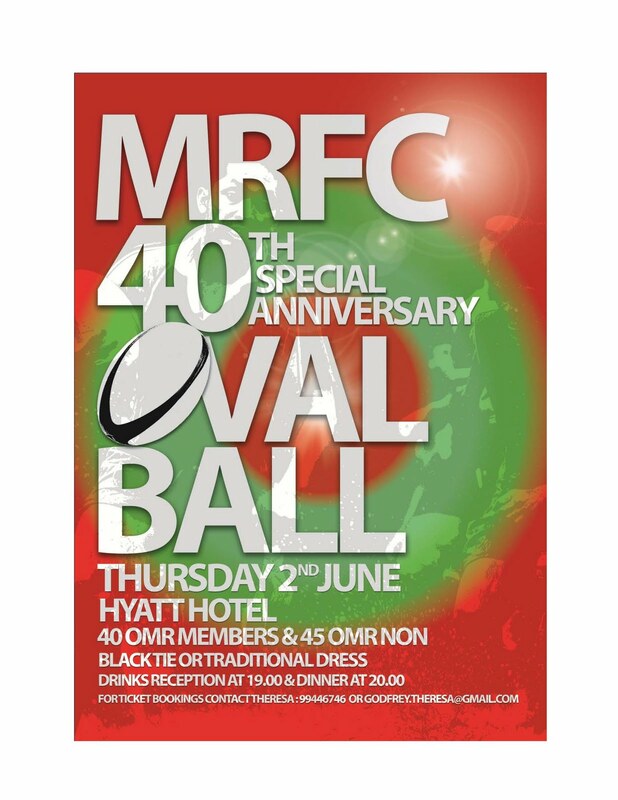 This is the 40th anniversary ball for Muscat Rugby here, so come on down and help them all celebrate! 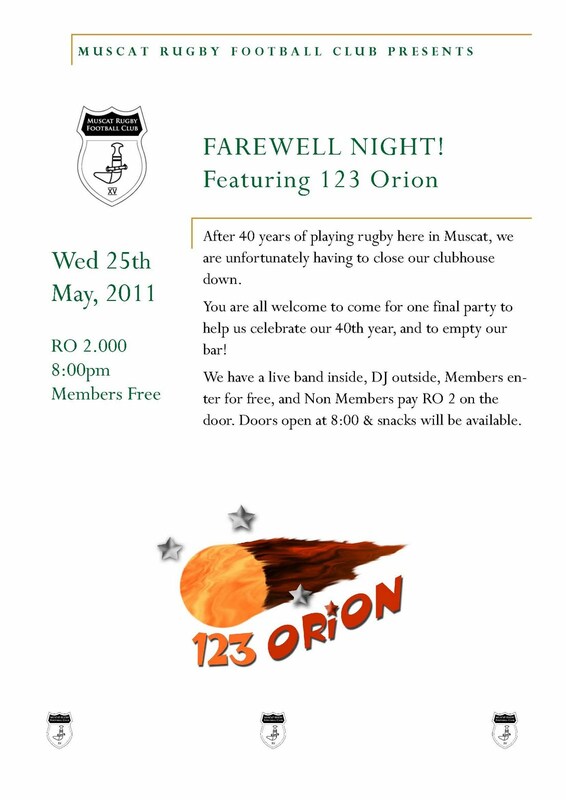 And finally - some of you may know that the clubhouse for the Muscat Rugby Club is unfortunately closing in it's current location in Al Khuwair at the end of the month. The land lord has decided he wants the land back, and to that has marked the end of the clubhouse. The pitch will remain, and so rugby here in Muscat will continue still. 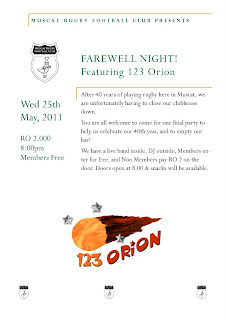 To say farewell to the clubhouse, MRFC are throwing one last party. All are welcome to come and watch the local band 123 Orion play live in the clubhouse, free to members, and RO 2 to non-members. It's the end of an era, and the start of a new one. Love your posts but PLEASE don't campare ANZO Balls with the Rugby Ball....Seriously no comparison!!! !